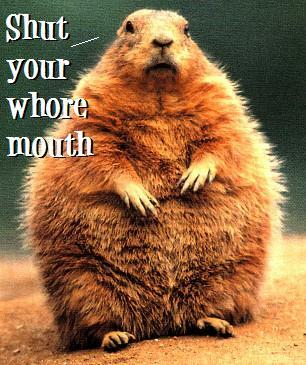 Jimmy the Groundhog of Sun Prairie, Wisconsin: Predicted an early spring. Nibbles of Asheville, North Carolina: Predicted an early spring. Grady, the groundhog at Chimney Rock State Park: Predicted six more weeks of winter. Chuckles of Connecticut: Predicted an early spring. Buckeye Chuck of Ohio: Predicted an early spring. Potomac Phil of D.C., a fake groundhog: Predicted six more weeks of winter. And Mrs. G. of Lincoln, Nebraska: Predicted an early spring. You guys? I’m starting to think groundhogs aren’t real meteorologists. Don’t forget about Cochranton Carl, another Pennsylvania prognosticator. He says “Early Spring”. What?! Nothing from French Creek Freddie? C’mon, bucdaddy…get your whistlepig’s guess listed with the rest. Unless, of course, he stayed inside because he realized the real French Creek is in Western PA. Idle speculation on my part, to be sure, but there it is. In a moment of high irony, Cochranton Carl actually lives on French Creek. It runs right through Cochranton. Have some of that, Freddie! Y’all enjoy your six more weeks of winter up there. If it’s six more weeks of this 60 degree weather we had on groundhog day, count me in. What was Balzac Billy’s (Phil’s cousin from north of the border) prediction? My Mom’s borough secretary of Punxsy (that’s the shortened version for those of us from that neck of the woods). In the 30+ years of living 15 min from town, I have NEVER been to Gobbler’s Knob and I will never go. I hate the rodent and aim for wild ones with the car. Ya know all those dinosaur statues around Pittsburgh? Punxsy does them rodent style *rolls eyes*. Eyewitness report: I watched Potomac Phil on Dupont Circle from my office window. There’s no way he saw any shadow that morning, but the City Council guys decided the weather has been so good they wanted 6 more weeks, and declared it so. After all, this is Washington: when we don’t like the facts, we just make ’em up. When I lived there, legend had it they went to some questionable lengths to ensure it would rain in Waynesburg on July 29. Something about cloud seeding. We wouldn’t have put it past them to pee out of a plane, either.